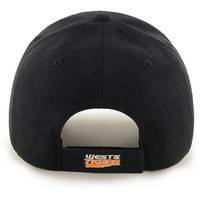 The Wests Tigers '47 MVP is a Structured Wool Blend Cap with a Velcro closure. 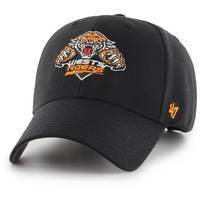 The front logo is raised embroidery with flat embroidery on the back strap. By continuing with the tradition of producing a unique mix of the finest headwear and apparel and maintaining an unparalleled attention to detail, we have established ourselves as a premium global sports lifestyle brand. We are proud to be a licensed partner with the four key professional American sports leagues: MLB, NFL, NBA, NHL, as well as over 900 colleges.As the second generation moves ’47 forward, we will never forget where it started - rooted in family values, focused on genuine relationships, and the simple belief that the future is what we create.